The EOYDC has helped me in many ways. Being that I dropped out of school, I basically had a confused way of thinking. I did not know what I was going to do with my life. I was a new mom with no job and no high school diploma. 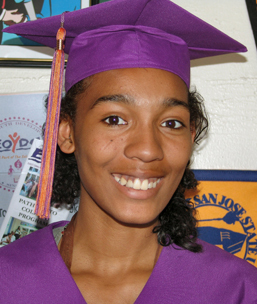 While I was pregnant, I had become familiar with the EOYDC and had come to find that they had a GED class, which meant I could officially be done with high school. I was excited, yet nervous. A couple of months had passed and I finally decided to excel in the GED Preparation class. To my surprise, when I took the evaluative test, my teacher said I was ready to take the test. With that knowledge, I took the exam and thanks to the EOYDC, I passed it the first time. The EOYDC has kept me motivated; the staff is as friendly and encouraging as can be. I had felt because I had a baby and that being the reason and stopped going, that my future was cloudy. Yet, the EOYDC made a way. Now I’m in college majoring in law.